Lawrence Self (1924-2001) was born in Surrey and completed his artistic training at The Royal College of Art. 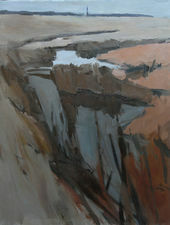 He moved to Suffolk in 1957 and landscape became the predominant theme in his work. He exhibited widely including repeatedly at the R.A. and his work is held in many public and private collections including The Ipswich Museums Collection and the Essex Art Gallery.